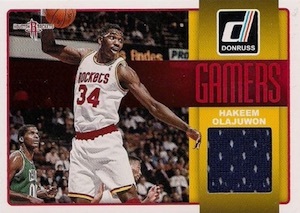 The brand doesn't have deep roots in the sports, but 2014-15 Donruss Basketball takes a nostalgic approach both in design and with several names from the hobby's past. But that doesn't mean it's all about yesterday. Three autographs and memorabilia cards per box bring the brand into the present. 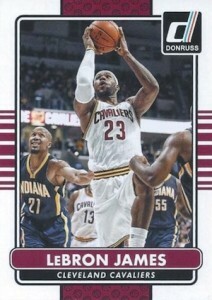 The 2014-15 Donruss Basketball base set has 200 cards. All of them have eight parallels that fall into two categories: Stat Line and Press Proofs. Season Stat Line and Career Stat Line are both numbered to 400 or less. Years in League Stat parallels is numbered to 22 or less. Press Proofs take a color approach. This include Purple (#/199), Blue (#/99), Silver (#/25), Gold (#/10) and Black (1/1). 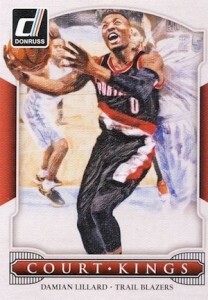 Every pack of 2014-15 Donruss Basketball has at least two inserts. Understandably, there are a lot of different sets. Basic inserts borrow from the past, both hoops and other sports. 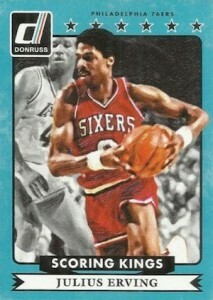 Rated Rookies is one of the most iconic names in Donruss history. The set has 40 cards and eight parallels. All parallels are numbered to 99 or less except for Swirlorama. The Rookies, a nod to Donruss update sets from the 1980s and '90s, has 30 cards and follows a similar parallel structure. 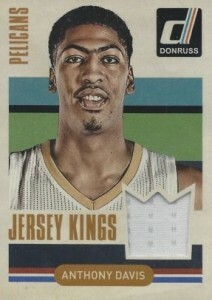 Among the other 2014-15 Donruss Basketball basic inserts are Court Kings (50 cards), Production Line (30 cards) and Scoring Kings (50 cards). Each of these has eight parallels, the majority of which are serial numbered. 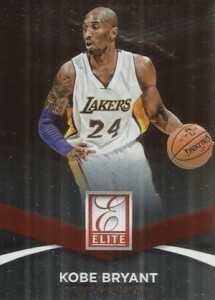 Elite breaks from being a standalone brand to become a 100-card insert set. 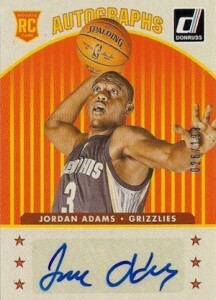 And in typical Elite fashion, there are several colorful and die-cut parallels. Basic versions come in seven varieties. There are also seven levels of Elite Status Signatures. 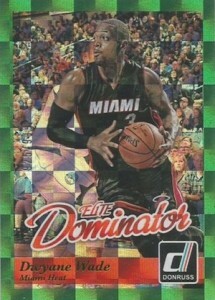 Elite Dominators (50 cards, #/999) uses a similar design as the insert used in 2014 Donruss Baseball. Signed versions are numbered to 149 or less. 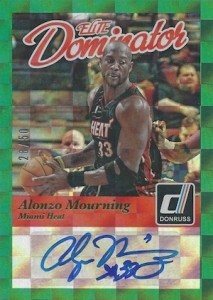 Like the other inserts, 2014-15 Donruss Basketball brings lots of variety to the set's autograph and memorabilia card content. 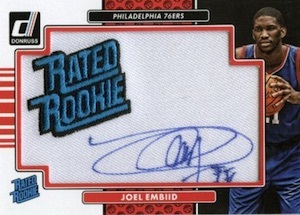 Rated Rookie Signature Patches (37 cards) feature a manufactured patch with the familiar logo. Signatures are done on a fabric material giving them a memorabilia-style look. 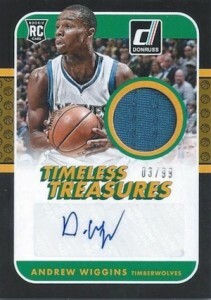 Timeless Treasures Jersey (10 cards, #/99 or less) borrow from the 1987 Donruss Baseball design. Prime versions are numbered to 25 or less. Other autograph sets include Signature Stars (33 cards, #/40), Rookie Autographs (33 cards, #/149 or less) and Rookie Autographs Die Cuts (33 cards, #/49). Game Jerseys, Game Threads and Jersey Kings round out the memorabilia sets. All three have Prime versions numbered to 25 or less. View the Excel spreadsheet for specific print runs. 33 cards. Serial Numbered #/40. I like it! Tons of inserts, and Elite has been incorporated smartly instead of being a standalone. Good move. Got box for $60. Great value for cost. Inserts galore. Elite cards are probably the nicest cards out of the box. 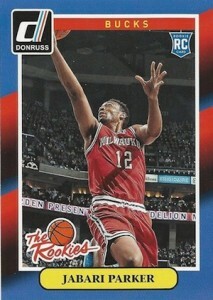 The Rated Rookies and The Rookies are also some of my favorites. 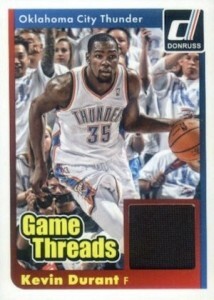 With 3 hits per box, this is one of the best values for you buck for Panini basketball products this year. What more can you ask for in a product set at this price point? 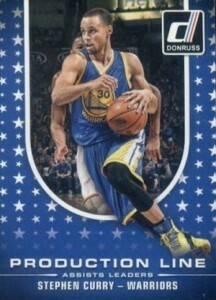 Like Forrest Gump’s box of chocolate, open 5 boxes of Donruss Basketball …and you’ll get 5 different boxes. 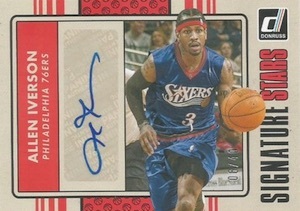 And for a Hoops product with an MSRP NOT exceeding 2 numerals prior to the decimal point? That’s a huge accomplishment! The sheer variety and history represented in DB is impressive, as are those athletes included upon the checklist. The product is a brilliant release for those, such as myself, who still enjoy reading the card backs…and for whom variety is important. 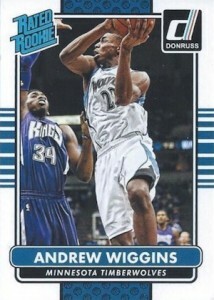 Opening Donruss and getting cards hailing from a fistful o’ brands was phenomenal, and the checklist was no D-league team roster. For an economy release, I like it. I do like the swirlorama and the variety of players including rookies. does not appear on the horizon.